I’ve tried them all, carnivorous meats from around the world, crocodile, ostrich, kangaroo burgers. Such exotic meats never scared me off. The simple word steak can send people’s tongue wagging, sizzling prime cut meat, cooked over a grill/pan, that can be cooked to how you like. There’s even a festival meatopia held here in the UK to celebrate all things meat. It’s not often you go to East London for some decent meat. The Greedy Cow is by the main road near to Mile End road, opened by two brothers serving flamed chargrilled steaks, burgers and exotic meats. Saturday lunchtime called for a quick bite, passing by so I thought I grab a burger. Upstairs had a private party, and there are a few tables on the corner. Glancing over the menu, there are plenty of exotic burger choices, even wagyu meat makes an appearance. I didn’t really fancy beef, so chose a classic lamb burger with my all time favourite sweet potato fries and to wash it down some homemade lemonade. There’s a choice to build your burger, with extras for a few extra pounds. Served on a wooden board with one-half of the bun opened, and slices of gherkins, and slaw on the side. 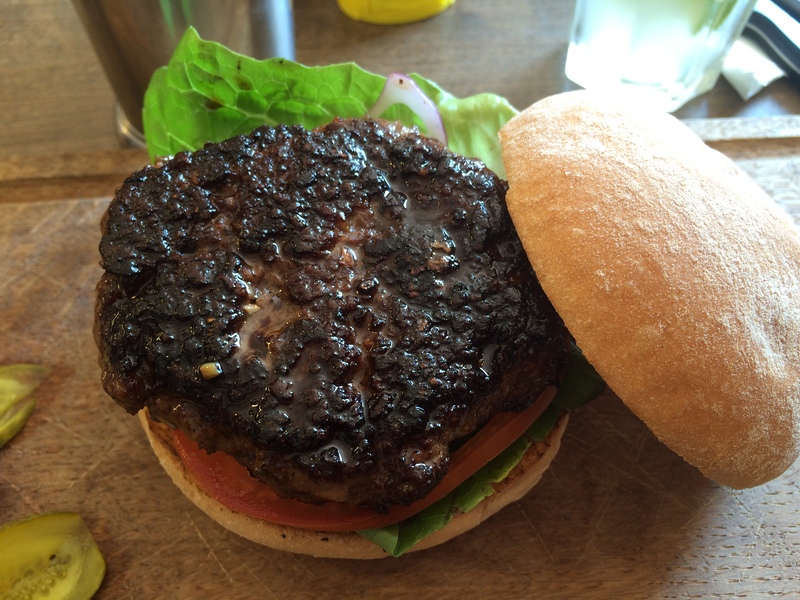 Yes I know my burger looks burnt from pictures, but don’t let that deceive you. It’s charcoal flamed, and hand rubbed with seasoning. You can see the juices sitting on top of the lamb meat. You get the other usuals, rocket leaves, beef tomatoes, served in soft sour dough buns. Darn tasty, luscious peppery plump meat full of flavour and has a smoky char. Sweet potato fries are twice-cooked for that extra crispness. 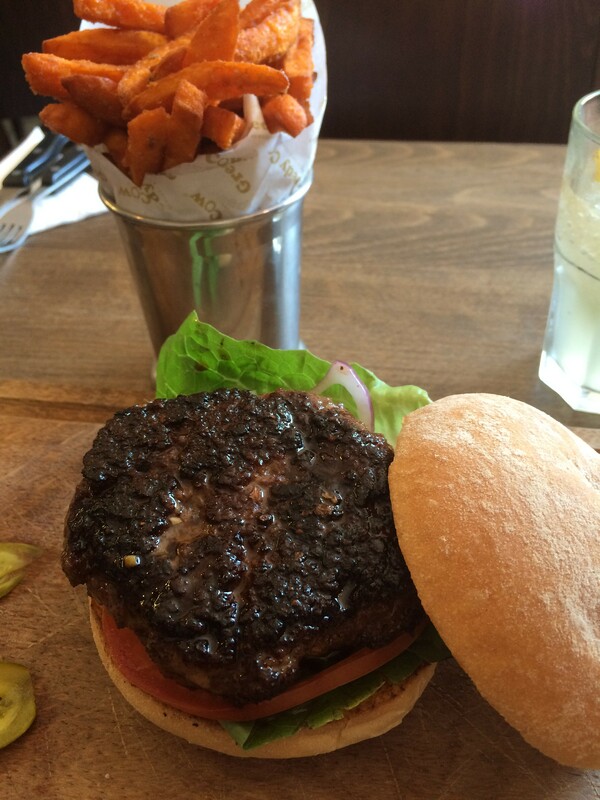 FYI Greedy Cow does lunchtime burger deals for £6.99 with unlimited drinks. What are you waiting for?